Jordan Storey insists he learned a lot from conceding a penalty in Preston’s draw with Hull as he continues his Championship education. The promising PNE defender was adjudged to have been the offender in a tangle with experienced front man Chris Martin late on in the 1-1 draw at the KCOM Stadium. That came back on October 20 and the 21-year-old’s next outing, his seventh since a summer move from Exeter, didn’t come until the 1-1 draw against Middlesbrough on Tuesday night. “It was frustrating on my behalf,” Storey said. “But clever players can get you in those situations so I think I’ve definitely learned from it. “It won’t happen again hopefully! “The strikers and the players in this division haven’t just got quality but they are clever as well. As well as learning from his own mistakes, Storey has plenty of help to call on in the dressing room. His return to Alex Neil’s side in midweek saw him slot in alongside Paul Huntington with skipper Tom Clarke next to him at right back. “All the lads are good with me,” said Storey, who came in for the injured Ben Davies. “They always give me bits of advice which is really helpful, especially the defenders and in particular Clarkey and Hunts. “They talk to me throughout the game as well which is a big thing. “You can’t really ask for any more experience either side of you than I had on Tuesday. 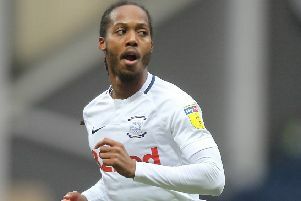 Despite being the more junior member of that trio, Storey knows he has to assert himself just as much as his more senior colleagues, something which has stood out during his time at Deepdale. “Playing centre back you’ve got to be one of the most vocal on the pitch so you can’t shy away from shouting or demanding things of other players,” he said. “It’s a massive part of a defender’s game and communication is key. “The earlier you can do it the more it will help you. “I used to struggle as a kid shouting at players and was a bit ‘should I do that, should I not?’.